I first found yoga as a very inflexible 18-year-old during my first year of college. But I stuck with it. I went to every one of those free classes. 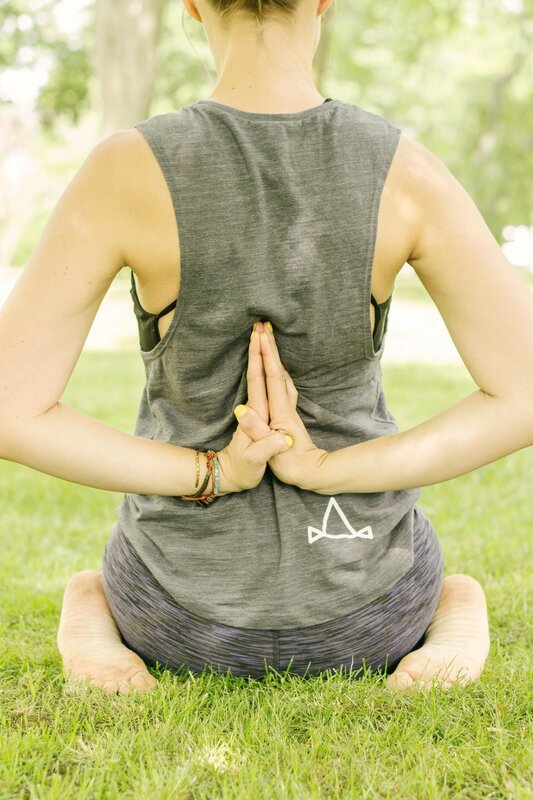 Sometimes I loved it, sometimes I absolutely hated it—but from early on I could see that yoga brought me a sense of stillness that nothing else could, and I immediately cherished that. For the next several years I found ways to keep yoga a part of my routine, always thinking of it as a way to move, stretch, build strength, and quiet my mind—but not giving it too much more attention than that. I was in the middle of graduate school and juggling two jobs when I decided to do my first teacher training. Captivated by the material, I started practicing every day and reading everything I could get my hands on. (This lead to my discovery of ‘yin’ and ‘yang’ and eventually acupuncture.) During this time, I discovered aspects of yoga that I didn’t even know existed, which slowly shifted my lifestyle, kindness, compassion and so much more both on and off the mat. When I first began teaching, I remember planning and practicing for my classes hours on end. I couldn’t help it—I was simply hooked; I loved it! I continued teaching for a few more years and was even asked to be a teacher’s assistant in another teacher training lead by a good friend. All of these things lit up my world. I felt I had purpose! Yoga spoke to me. Despite all of this, I had this nagging feeling that I wanted to do more with my yoga teachings. I wasn’t sure what, I knew it wasn’t about being the strongest or the most flexible, because let’s be real—I am not and will never be ‘that yogi.' I wasn’t sure what, but I knew I needed and desperately wanted to bring more to my students as a teacher. So I did what I always do when I’m not sure of something: I journaled about it, discussed with the universe, and made a pro/con list. My soul searching determined it was time to focus on acupuncture and have faith that the yoga piece would resurface again. During this time, I developed more of a Yin style practice at home. I began practicing every morning before any of my activities began for the day, and depending on the day, I could spend the entire hour in as little as 2-3 poses accompanied by meditation and pranyama (breath work). Having to put so much of my mental strength to work every day studying acupuncture, I found my body and mind were simply exhausted and a gentle practice was what called me. This. Got. Me. Through. School. It got me through challenging times, stressful times, times I wanted to give up, times when all I could do was cry… I always came back to my mat. At many points in my life, I felt it was my only constant. I am being honest, I am not in the least being dramatic. Everyone needs something they can rely on in this way. I’m happy to say I’ve found mine on my beat up old Jade yoga mat. Fast forward a couple of years to where I’m at now, and my yoga road has indeed resurfaced! The heart never lies; you can always trust the universe. After spending years in acupuncture clinics observing people’s tendencies, their complaints, their pain—I have finally found what it was I wanted to bring to my yoga classes. I wanted to bring soul. I wanted to bring something deeper that would get people feeling better longer, feeling more grounded and capable in their daily lives. Combining acupuncture theory, acu points, and all aspects of yoga does this for me. The two go so beautifully together that it feels wrong to pull them apart. Being an “acupuncturist by day” allows me to see the intricacies of the body. I no longer spend hours dreaming up the most creative transitions between poses; I now think of which poses go together to get you into a posture safely and reduce injury. I do not plan my peak poses to be unattainable for 99.9% of the population, I now plan them based on the meridian in focus, and what will help a person open up spiritually. I now work backward to plan my classes with my end question being, “How do I want my students to feel when they leave?” And the answer is simple: grounded in compassion and gentleness, strong in belief and desire. Join me for a workshop themed around the Heart Chakra and LOVE! Conveniently scheduled around Valentine’s Day, a holiday that brings up a lot of feelings for people, this workshop will help us begin to shed some of those protective layers we build around our heart through journaling, asana (yoga postures), and acupuncture. *Historically, my workshops at Zen Den always fill to max capacity, sign up early via the MindBody App. Further questions, please email me directly. These workshops combine two powerful healing modalities- yoga and acupuncture, and casually throws in a little prospective only a full moon can provide. The class is designed to tap into essential acupuncture meridians through means of yoga asana, pranyama, meditation, and intention. This class aims to support your energetic balance through the changing seasons. Our next book is a non-fiction, easy read that takes us step by step through the yoga sutras. The sutras are the foundation of yoga, and a working knowledge of them will greatly increase your experience and your healing on the mat. This is an informal event, and cozy socks are encouraged! It runs “pot-luck” style, so bring some light munchies and your favorite tea to share! All you have to do is grab the book from the link below, buy yourself a new journal, get reading, and show up to the den on Saturday, March 24th. This retreat is one for the record books. If you have had a yoga retreat on your “bucket list” for a while now, I highly suggest you look into our Costa Rica getaway planned for early November. The retreat center is known the world over, and seasoned yogis such as Shiva Rea even choose to hold events there! To top it all off, Nosara, Costa Rica is in a Blue Zone, meaning people who live there are healthier and they live longer! It is said that swimming in Nosara’s water adds a day to your life, and I 100% concur! For more information please visit https://zenden.yoga/retreats/ . Again, this WILL fill! Sign up early! I’m teaming up with child yoga specialist Ann-Noelle McCowan for this one! Sessions combine Chinese Medicine theory and yoga movements to help kids develop coping mechanisms for dealing with things such as stress, anxiety, and depression. Please email me directly for more information! There are a few options for this. I have space for private yoga sessions in both of my locations, there is also an option for me to visit you at your home. It is no secret that I love teaching yoga, and that I absolutely love acupuncture. Combining the two is truly magical, and with a thorough intake, and a clearly defined goal the possibilities are endless! A specifically designed class just for you may be just what you need to help reach your health goals. Not so into needles? There is also an option for only private yoga sessions. Contact me directly for more information.